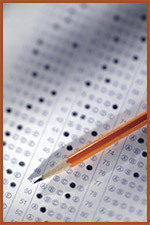 The MCC Testing Center proctors tests for: GED, make-up exams, placements, proficiency, CLEP, correspondence and more. Except for make-ups, many of our other tests require appointments, so please be sure to call ahead at (815) 455-8984. Note: We require photo identification for all exams. Exams need to be completed five minutes prior to the Center’s closing time. You need to apply to MCC, pay the required non-refundable $15 application fee and allow two business days for your student ID number to be assigned before you can take a placement test at MCC. We must allow for instructor’s minimum time requirements.